Karl Marx may have been the pioneer, but many other Jews were also involved in the struggle for communism, particularly in the early days of the Russian revolution. Personally, I don’t think that we have any apologies to make for this phenomenon. Having suffered unbearably under successive oppressive regimes, many of those political activists genuinely thought communism would be better for the people than czarist corruption. Their sense of idealism fueled hopes for a better life and a more equitable future for all. On paper, communism was a good idea. The fact that it failed—and that the new leaders outdid their predecessors’ oppression—may reflect the personalities involved as much as the system they promoted. What is Judaism’s economic system? Is there one? I would describe it as “capitalism with a conscience.” In promoting free enterprise, the Torah is clearly capitalistic. But it is a conditional capitalism, and certainly a compassionate capitalism. Winston Churchill once said, “The inherent vice of capitalism is the unequal sharing of blessings. The inherent vice of communism is the equal sharing of miseries.” So Judaism introduced an open market system, where the sharing of blessings was not left to chance or wishful thinking, but was made mandatory. Our Parshah gives us a classic example. Shemittah, the Sabbatical year, was designed to allow the land to rest and regenerate. Six years the land would be worked, but in the seventh year it would rest and lie fallow. The agricultural cycle in the Holy Land imposed strict rules and regulations on the owner of the land. No planting, no pruning, no agricultural work whatsoever in the seventh year—and whatever grew by itself would be “ownerless” and there for the taking for all. The owner could take some, but so could his workers, friends and neighbors. The landowner, in his own land, would have no more right than the stranger. For six years you own the property, but in the seventh you enjoy no special claims. This is but one of many examples of Judaism’s “capitalism with a conscience.” There are many other legislated obligations to the poor—not optional extras, not even pious recommendations, but clear mandatory contributions to the less fortunate. The ten percent tithes, as well as the obligation to leave to the poor the unharvested corners of one’s field, the gleanings, and the forgotten sheaves are all part of the system of compassionate capitalism. Judaism thus presents an economic system which boasts the best of both worlds—the advantages of an unfettered free market, allowing personal expression and success relative to hard work, without the drawbacks of corporate greed. If the land belongs to G‑d, then we have no exclusive ownership over it. G‑d bestows His blessings upon us, but clearly, the deal is that we must share. Without Torah law, capitalism fails. Unbridled ambition and the lust for money and power lead to monopolies and conglomerates that leave no room for the next guy and widen the gap between the haves and the have-nots. The Sabbatical year is one of many checks and balances that keep our capitalism kosher and kind. Some people are too businesslike. Everything is measured and exact. Business is business. If I invited you for Shabbat, then I won’t repeat the invitation until you reciprocate first. If you gave my son $50 for his bar mitzvah, then that is exactly what I will give your son. We should be softer, more flexible, not so hard, tough and businesslike. By all means, be a capitalist, but be a kosher capitalist. What a person is “worth” financially should be irrelevant to the respect you accord to him. Retain the traditional Jewish characteristics of kindness, compassion, tzedakah and chesed, generosity of spirit, heart—and pocket. May you make lots of money, and encourage G‑d to keep showering you with His blessings by sharing it generously with others. I have ceased to think that any system is the culprit or the solution. Money is only fiat currency created by nothing other than debt. There is no real money or assets other than the collateral someone may offer to cover an IOU if unpaid. Civilization has been functioning economically for the past 300 years on evermore sophisticated ways of producing debt and, therefore, a form of barter using an instrument that has no inherent value---debt. I must respectfully disagree with your position that Torah indorses Capitalism. I will confine myself to only two points, though there are many more. 1) Capitalism to function requires the ability to charge interest which Torah strictly prohibits Jews from doing in either personal or business transactions. 2) The Yovel (Jubilees) year is, in part, the most effective redistribution of wealth possible in an agrarian society, which ancient Israel was. Redistribution of wealth is an . anathema to all pure capitalists. 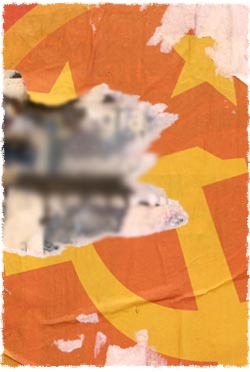 Unfortunately, Communism, which never actually existed, became associated with Soviet. Just because it "failed" in a world that is a disjointed mix of feudalism, Imperialism, bourgeois socialism, and fascism doesn't mean that Communism, in and of itself, is a failure. Les, you are prejudiced. Communism is as much a product of evolution as anything else. Communism doesn't happen because people vote or fight for it. It takes decades of ever-more-sophisticated socialistic development. Having said that, I would argue that capitalism cannot be benign or moral. Things have no use value--only profit value. Capitalism by its nature must generate ever increasing amounts of profit no matter the cost. Michael/Greensboro has no idea what he is talking about. Jews who accept Christ cannot be counted on for minyanim, nor legally marry another Jew under a chuppah, nor give witness in a Beit Din & can't be buried in a Jewish cemetery.
" On paper, communism was a good idea." Sir, you are either an economic & political illiterate or you are still working for the communists. As others have pointed out below & millions have died trying to flee/expose, communism is an abject failure, it is synonymous w/ dictatorial tyranny, it is anti-Jewish, & anti-Christian, it has nothing to do with real Jewish values, and it is responsible for the slaughter of 100's of millions of men & women. Interesting attempt to relate Jewish principles and capitalist ideals, but I think you failed to find a real connection/combination of the two. The fact that Jews have to let their fields rest every seventh year does not negate what you call capitalist greed, even if practice were still relevant today. The other thing that may set "Jewish capitalism" apart is the mandatory donation of ten percent of a persons income every year; however, I believe that this principle exists in the USA's capitalism in the form of taxes that are used for income redistribution, such as social security, welfare, Medicare, etc. Marx was not Jewish His parents converted out when he was a child and he was ANTI-JEWISH his entire life. Intersting: John Milton and likeminded people promoted liberal capitalism because they believed that G-d is immanent but poeple have a power of their own and action can be take without a central authority. Milton was a puritan and the vitalists opposed the rather cavinistic- minded mechanists. Moreover, Harvey discovered that the heart is important but the blood does not only gain energy from it but from itself. Communism and Messianic Idea You are right, Rabbi Goldman, there is so much in common between the lofty Communist idea and the rules of business prescribed by Torah. I grew up in Soviet Union. Maybe, this is why now that I became religious, I am so passionate about Messianic Idea. Do your business honestly, and you advance the coming of the Perfect World! May this idea become the habit of all people. At least all Jewish people.